Leading P2P lender Prosper has executed an impressive $90 million in loans through its marketplace but continues to remain appropriate only for those wishing to invest in high prime credit quality consumer debt. 10% of the roughly 2,500 loans listed on the site at any time are in the high prime tier (credit ratings AA, A and B), in fact, most of the listed loans do not fund. About a third of the loans that fund and become active and billed are in the high prime credit tier. 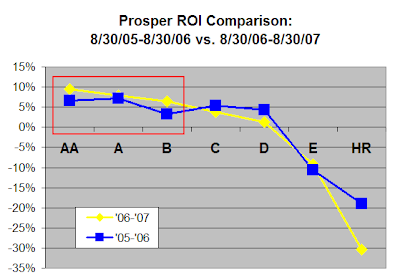 The graph below shows an ROI comparison of Prosper's total loan portfolio by credit rating in two time snapshots, August 30, 2005 - August 30, 3006 in blue and August 30, 2006 - August 30, 3007 in yellow. In the last year, AA, A and B loans funded at 11-15% and have an ROI of 6.5-9.5% once adjusted for default. Source: Prosper performance data. Note: the default view which specifies 0 delinquencies and 0-2 credit checks in the last 6 months should be removed to view the total loan portfolio. Is 6.5-9.5% an appropriate return? It depends on a full consideration of the risk and return profile of the investment. Theoretically, high prime consumer credit loans are low risk; the historical default rate for Prosper loans has been 2% for AA and A loans and 4% for B loans. As compared with the stock market, which has on average for the last 80 years delivered a pre-tax return of 8% with a higher level of risk, Prosper loans look more attractive. 6.5-9.5% also provides a healthy risk premium over risk-free t-bills or money market funds and CDs which are currently yielding about 4.5%. While Prosper's entire loan pool has had some dodgy returns, Prosper created the "Prosper Select" index that is of higher quality than the general prosper loan. They e-mail out monthly summaries showing how things are going. Hi Mike, Thanks for the comment (I love the word "dodgy") and link. And nice P2P lending blog, btw. Yes, with the "Select" portfolio, Prosper showcases the top tier of each credit grade, specifically, loans with "zero current delinquencies, three or fewer credit inquiries, and a debt-to-income ratio of 40 percent or less, AA and A credit scores of 720+, B, C, D credit scores 600-719 and E credit scores 560-599." It is incumbent on the lender to invest per these or similar parameters to see a higher ROI lower default return on their portfolio. your blog is especially interesting since it has to do with Select Portfolio. As much as I know, Select Portfolio Servicing, Inc. is a loan servicing company. People need money and they go to the company to get a loan or a credit, but then they have to resolve numerous misunderstandings and deal with the unfriendly customer service. After checking out www.pissedconsumer.com, I do have one question – do I really need that money?